Sequel Roundup: Frozen 2, Captain America 3, Jurassic World, And More! Mark Ruffalo tweets from the set of Avengers: Age of Ultron. Director Matt Reeves explains what Dawn of the Planet of Apes is really about. Max Brooks is bringing Extinction Parade to television. Plus, a behind-the-scenes look at Jurassic World. Spoilers now! It's possible. We haven't seen a screenplay yet that I've been able to sign off on.… There's a lot of variables that affect the final outcome once it leaves the studio lot, so we are very careful. 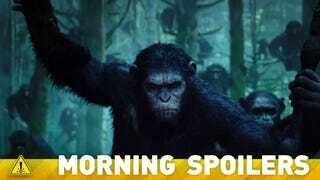 What excited me was not about coming into the story with apes as villains. There are no villains. . . . It's a story about survival.
. . . As you start the movie, you think the viral apocalypse has wiped out all humans. And you spend [the first] 15, 20 minutes in the world of the apes.
. . . There are two families – an ape family and human family. And you're going to see who survived. I only brought the idea to one company, Legendary, because they do the kind of quality work of which any writer would be proud. While the comic series from Avatar continues, I am thrilled to be working with Legendary to develop Extinction Parade into an innovative new series for television. No, unfortunately there aren't any flashbacks to see [their relationship]. But if we have the chance to go to a second season the writers all thought that it would be interesting to do each character in flashbacks to show how they grew up. But there's no flashbacks to show Raven and Finn yet, but they've been together pretty much their whole lives. They were best friends and Raven's family wasn't really in the picture. And the only person that ever really took care of her was the boy next door, Finn. As children he would share his meal rations with me, to being there all throughout school, he was pretty much the only stable thing in my life. Everyone else in my life would come and go and I couldn't depend on them. Finn was the only real rock. He's my first love and my only love and my best friend. And kind of my only friend. I think that's what makes it so heartbreaking, how Raven risked everything to come to Earth to be with him at the most awkward timing ever since he just hooked up with Clarke. Exactly. Oh yeah. It puts Finn in a very peculiar position and it makes him really have to ask himself some really tough questions. I think it's possible to love someone but not always be in love with someone and I also think it's very possible to love two people at the same time. Finn's heart is literally torn into two. I think him and Clarke really connected but he's known Raven his entire life. So there's this question of what's the grass like on the other side? Who's this new girl? He also thought he'd never see me again. As far as he was concerned, I was dead to him. I'm in space and he's on Earth. Finn did the best that he could with what he knows. We definitely get thrown into very difficult positions. MARVEL'S AGENTS OF S.H.I.E.L.D. – "Nothing Personal" – Just when there's no one left to trust, Agent Maria Hill (Cobie Smulders) — from "Marvel's The Avengers" and "Marvel's Captain America: The Winter Solider" — returns to team up with Coulson as S.H.I.E.L.D. is being destroyed around them, on "Marvel's Agents of S.H.I.E.L.D.," TUESDAY, APRIL 29 (8:00-9:01 p.m., ET) on the ABC Television Network. MARVEL'S AGENTS OF S.H.I.E.L.D. — "Ragtag" – In the last episode before the epic season finale, Ward 's betrayal and HYDRA's shocking secrets are revealed as Coulson's team goes undercover on a mission that leaves no one unscathed, on "Marvel's Agents of S.H.I.E.L.D.," TUESDAY, MAY 6 (8:00-9:01 p.m., ET) on the ABC Television Network. Here's the promo for next week's episode. "ONCE UPON A TIME – "A Curious Thing" – Zelena threatens to kill Henry if Hook – whose lips have been cursed by the Wicked Witch — doesn't proceed with kissing Emma, which will drain all of her magical powers away, and things begin to heat up between Regina and Robin Hood. Meanwhile, back in the Fairy Tale Land that was during the past year, Snow and Charming go in search of Glinda, the Good Witch of the South, to see if she can help them defeat Zelena, and the curse that will ultimately send the Fairy Tale characters back to Storybrooke is cast — but from an unlikely source, on "Once Upon a Time," SUNDAY, APRIL 27 (8:00-9:00 p.m., ET) on the ABC Television Network." ONCE UPON A TIME – "Kansas" – SUNDAY, MAY 4 (8:00-9:00 p.m., ET) on the ABC Television Network. ONCE UPON A TIME – TWO HOUR SEASON FINALE – SUNDAY, MAY 11 (8:00-10:01 p.m., ET) on the ABC Television Network. RESURRECTION – "Schemes of the Devil" – With the help of Bellamy and Sheriff Fred, Tom leads the charge in the search for Rachael, but her situation becomes increasingly dire as her captors grow more desperate. Maggie and Dr. Ward continue their medical research on the resurrected subjects and a series of shocking discoveries sets them on the brink of a game changing find, however, their focus shifts when Arcadia is suddenly in the throes of an epidemic, on "Resurrection," SUNDAY, APRIL 27 (9:00-10:01 p.m. ET) on the ABC Television Network." "RESURRECTION – SEASON FINALE – "Torn Apart" – The town of Arcadia is in a state of chaos when the return of the deceased reaches a critical mass. Bellamy has no other choice than to ask for outside aid which backfires when Sheriff Fred steps in with his own agenda, triggering a siege on the town that no one saw coming, on the season finale of "Resurrection," SUNDAY, MAY 4 (9:00-10:01 p.m. ET) on the ABC Television Network." Here's a promo for episode 9.20, "Bloodlines."